Live the entire adventures of the Dragon Knight, in a great RPG that includes the complete and re-mastered adventure Ego Draconis, and the brand new adventure Flames of Vengeance! Explore Rivellon, a fantasy world ravaged by a secular war. As the last heir of the fearsome Dragon Knights, master your new powers to end the threat that lurks in the shadows above the kingdom! Follow your path through a huge living world; its inhabitants\' destiny depends on each one of your choices. Freely create and develop your character, specialize him and learn many powers of destruction to fulfil your destiny!2 complete adventures for over 100 hours of gameplay. Hundreds of equipment pieces including armour, swords, war hammers, bows, etc. Fight your enemies on the ground, or crush them from the sky using your Dragon form! 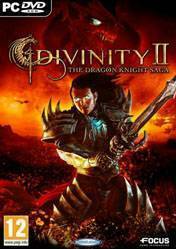 There are no comments yet about Divinity II: The Dragon Knight Saga . You can be the first one!